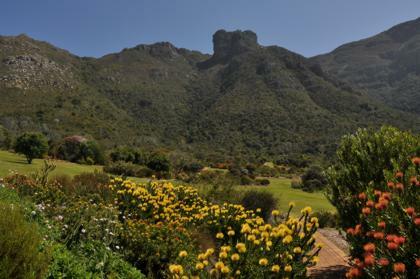 The Fynbos Walk leads from the Viewing Deck at Rycroft Gate (Gate 3) through the Restio Garden, Protea Garden, Fynbos Garden, Buchu Garden and Erica Garden. They all display the vegetation unique to the Cape Floral Kingdom known as fynbos (pronounced f-ain-boss). The path traverses the highest points of the Garden and offers superb views of the eastern slopes of Table Mountain and panoramic views across the suburbs of Cape Town on the Cape Flats to the Hottentots Holland Mountains. It draws a rich variety of birds, many of which are the pollinators of the fynbos plants. Four species of sunbird are frequently seen here: the Orange-Breasted, the Malachite, the Greater Double-Collared and the Lesser Double-Collared. 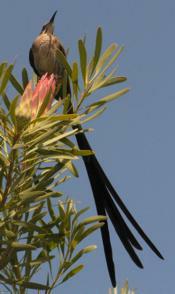 The Sugarbird with its distinctive long tail is also a regular visitor. Cape Francolin are a common sight and a Dikkop is sometimes to be seen in the quieter corners. Visitors may also see the Striped Mouse scuttling about in search of things to eat. There are always interesting plants and flowers to be seen on the Fynbos Walk, but it is at its most colourful in winter-spring-early summer (from July to December).